The Southeastern Beekeepers Association was founded June 10, 1999. The first meeting was called to order by Troy Holbrook, and our first board of directors consisted of Aaron Helmick as president, Maryann Estep as vice president, and James Massey as Secretary/Treasurer. At that first meeting, it was decided that the association would have monthly dues, monthly meetings, and an annual bee-day/bee-school. At the time, there were 30 members. 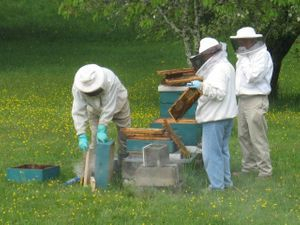 Thanks to a grant from the Monroe Producers and Growers Association in 1999, we have grown in numbers and are proud to say that we have stayed connected with many beekeepers in the area. Our membership is currently around 60 members, though it has been as many as 100+, and we are committed to fostering apiary education in southeastern West Virginia. Bees are such a critical component of a healthy, balanced agricultural system, and are often incorrectly regarded as a difficult and costly endeavor. From honey to wax, pollination to pest control, bees offer so much that comparatively to other agricultural pursuits, they are one of the most profitable, rewarding and enjoyable projects you could ever undertake. If you are not a member, please consider joining. As a member, you have a voice in the association, and as a member you help our association have a greater voice when it comes to concerns about bees in our state. With regulations changing every year, and problems new and old facing our apiaries, as a member you will have the opportunity to hear the latest on care, treatment, safe and green practices, and most of all, be kept abreast of issues facing beekeepers not just here, but nationwide. Join today! Come share your experiences, your interests, pictures, and ask questions about everything from crafts, recipes and the all important Honey Bee!